Author contributions: Lai CY and Scarr E wrote the paper; Lai CY summarized the review table; Scarr E, Udawela M, Everall I, Chen WJ and Dean B made critical revision in the manuscript; Lai CY and Dean B composed the structures the article; Dean B contributed to the idea of the review. Supported by The National Science Council of Taiwan, Nos. 102-2917-I-002-002 and 103-2811-B-002-107; the Australian Research Council, No. FT100100689; and the National Health and Medical Research Council, No. APP1002240. Identifying biomarkers that can be used as diagnostics or predictors of treatment response (theranostics) in people with schizophrenia (Sz) will be an important step towards being able to provide personalized treatment. Findings from the studies in brain tissue have not yet been translated into biomarkers that are practical in clinical use because brain biopsies are not acceptable and neuroimaging techniques are expensive and the results are inconclusive. Thus, in recent years, there has been search for blood-based biomarkers for Sz as a valid alternative. Although there are some encouraging preliminary data to support the notion of peripheral biomarkers for Sz, it must be acknowledged that Sz is a complex and heterogeneous disorder which needs to be further dissected into subtype using biological based and clinical markers. The scope of this review is to critically examine published blood-based biomarker of Sz, focusing on possible uses for diagnosis, treatment response, or their relationship with schizophrenia-associated phenotype. We sorted the studies into six categories which include: (1) brain-derived neurotrophic factor; (2) inflammation and immune function; (3) neurochemistry; (4) oxidative stress response and metabolism; (5) epigenetics and microRNA; and (6) transcriptome and proteome studies. 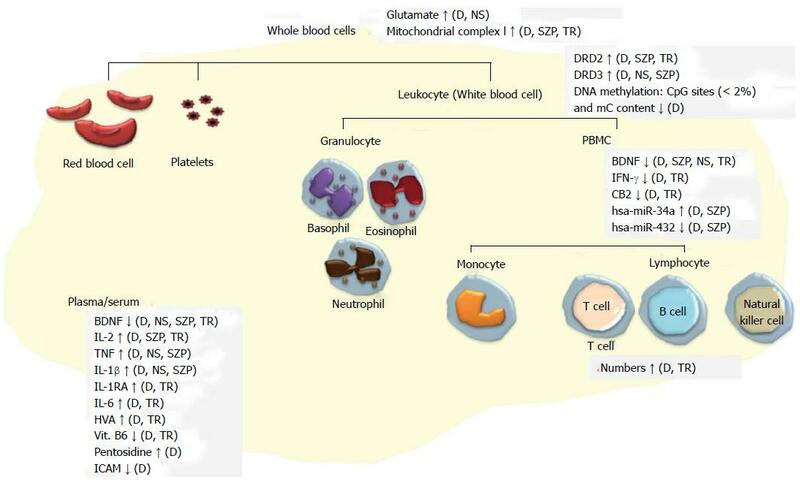 This review also summarized the molecules which have been conclusively reported as potential blood-based biomarkers for Sz in different blood cell types. Finally, we further discusses the pitfall of current blood-based studies and suggest that a prediction model-based, Sz specific, blood oriented study design as well as standardize blood collection conditions would be useful for Sz biomarker development. Core tip: In recent years, there has been search for blood-based biomarkers for schizophrenia (Sz) as a valid alternative. However, it must be acknowledged that Sz is a complex and heterogeneous disorder which needs to be further dissected into subtype using biomarkers. The scope of this review is to critically examine published blood-based biomarker of Sz, focusing on possible uses for diagnosis, treatment response, and their relationship with schizophrenia-associated phenotype. We suggest that a prediction model-based, Sz specific, blood oriented study design as well as standard blood collection procedures would be useful for development of Sz biomarkers. Identifying biomarkers that can be used as diagnostics or predictors of treatment response (theranostics) in people with schizophrenia (Sz) will be an important step towards being able to provide personalized treatment and would support efforts to develop new drug treatments[1-3]. Sz is a psychiatric disorder and there have been great efforts to the study of potential neuronal and glial abnormalities that may provide the basis of the aetiology of the disorder. However, findings from such studies have not yet been translated into biomarkers that are practical in clinical use because brain biopsies are not acceptable and neuroimaging techniques are expensive and the results are inconclusive. Thus, in recent years, there has been search for blood-based biomarkers for Sz as a valid alternative[5,6]. Blood-based biomarkers are regarded as a feasible option because the dysregulation of gene expression, epigenetic patterns, protein quantities, metabolic and inflammatory molecules in peripheral blood have been shown to have distinct patterns in people with Sz[4,5,7-11]. In addition, the strong heritability of Sz suggests that there may be genetic markers detectable in peripheral tissue. Finally, there are data that suggest changes in gene expression[13,14], epigenetic patterns, proteomic/metabolic markers[16-18] and functional cellular pathways[16,19-21] are present in both the peripheral and central nervous system (CNS) tissue. More recently our concepts about the interactions between the brain and periphery have been expanded with data suggesting that the CNS may influence gene expression and metabolism in the peripheral blood via cytokines, neurotransmitters, or hormones[22,23], while immune-related alterations in the CNS may in turn originate from peripheral blood[10,24] (Figure 1). Figure 1 A schematic representation of central nervous system-peripheral blood tissue interactions. 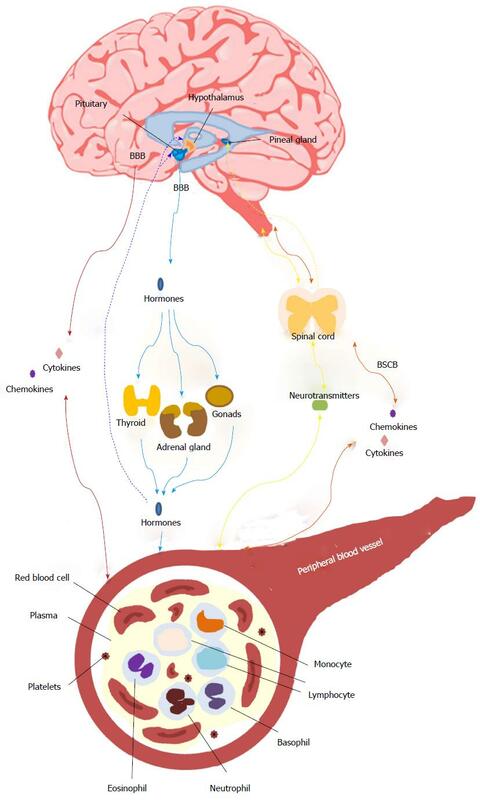 CNS stress may influence gene expression, DNA methylation, and cell metabolism in the peripheral blood via cytokines, neurotransmitters, or hormones with different transportation methods. Cytokines or chemokines can transport across the BBB (red lines) or BSCB (orange line) either from CNS to peripheral blood tissue or vice versa. The hormones are exerted by CNS and transported across the BBB via blood system to the target tissue (blue lines) and in turn regulate CNS through negative feedback (blue dashed lines). Another connection is the stimulated (yellow line) or negative feedback inhibition (yellow dashed line) via spinal cord via the parasympathetic or sympathetic nervous system. It is noted that there are several blood cell types with their own features in the peripheral blood vessel. The figure is an extension of Figure 1 in Marques-Deak et al. BSCB: Blood-spinal cord barrier; CNS: Central nervous system; BBB: Blood-brain barrier. Whilst there are some encouraging preliminary data to support the notion of peripheral biomarkers for Sz, it must be acknowledged that Sz is a complex and heterogeneous disorder[25,26] which needs to be further dissected into subtypes using biological based and clinical markers. Therefore it is probable that some types of peripheral blood biomarkers may only define sub-sets of people with Sz. In addition, whilst most studies have focused on diagnosing Sz, biomarkers that can indicate the clinical course or drug treatment response will also be of clinical use. Another concern is that whilst the use of convergent functional genomics methods[12,28] is a good idea, so far the selection of most candidate biomarkers has been based on findings related to the brain. This approach would be likely to miss any periphery oriented dysregulations which could be associated with Sz. The scope of this review is to critically examine published studies of blood-based biomarkers for Sz, focusing on possible uses for diagnosis, drug treatment response, or their relationship with phenotypes associated with Sz in different blood cell types. Manuscripts were identified by searching PubMed (http://www.ncbi.nlm.nih.gov/pubmed ) using the keywords “schizophrenia” and “peripheral” and “biomarker”, in addition any articles whose title included “schizophrenia” and “peripheral” were also included. Only articles written in English and published between year 1995 and 2015 were included, the details of which are given in supplementary table. Briefly, of the 79 identified studies, 35% were performed in serum/plasma; 24% in peripheral blood mononuclear cells (PBMC) including monocytes and lymphocytes; 16% in lymphocytes; 13% in whole blood; 7% in white blood cells (leukocyte) including monocytes, granulocytes, and lymphocytes; 4% in platelets; and 1% in red blood cells (Figure 2A). 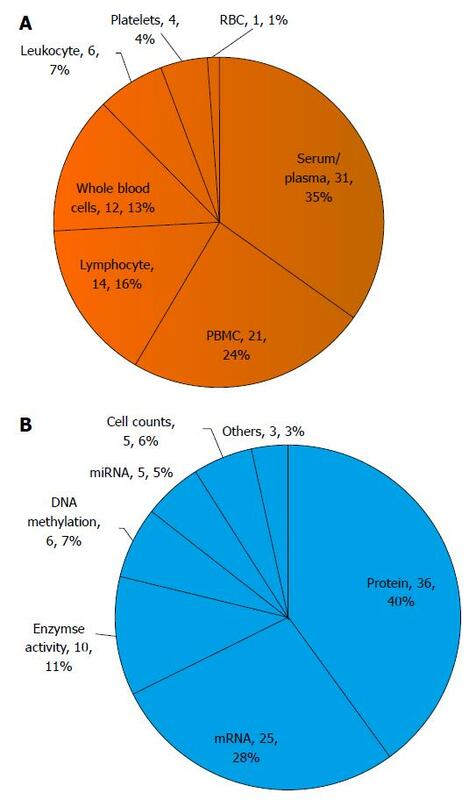 In terms of experimental targets of analysis, nearly 40% examined differences in protein levels including cytokines and metabolites; 28% examined mRNA levels; with the remaining studies focused on enzyme activity assays (11%), DNA methylation patterns (7%), cell numbers (5%), miRNA levels (5%), or others (3%) (Figure 2B). Figure 2 A summation of studies into peripheral biomarkers for schizophrenia. Studies are classified based on A: Blood cell types (e.g., serum/plasma, PBMC, lymphocytes, whole blood cells, leukocyte, plateles or red blood cells); B: Research focus (e.g., proteins, mRNA, enzyme activity assays, DNA methylation, or miRNA). The numbers indicate the number of studies in the categories, and its overall percentage. PBMC: Peripheral blood mononuclear cells; RBC: Red blood cell. Overall, the studies can be sorted into categories which include: (1) brain-derived neurotrophic factor (BDNF); (2) molecules involved in inflammation and immune function; (3) neurochemistry; (4) oxidative stress response and metabolism; (5) epigenetic regulation and miRNA; and (6) transcriptome and proteome studies. In the following sections, we organized the narration based on biological functions and pathways while emphasizing (1) the biomarkers for diagnosis (D); (2) drug treatment response; (3) their correlations with phenotypes (i.e., clinical symptom, cognitive function, or brain imaging) present in people with Sz. It has been postulated that Sz is associated with altered neurotrophin levels in blood, particularly lowered levels of BDNF[29,30]. A recent meta-analysis of a total of 41 studies and more than 7000 participants indicated that the serum/plasma BDNF levels were moderately reduced in Sz compared with controls. Using DNA from whole blood, it has also been suggested that the promotor region of the BDNF gene has higher methylation levels in people with Sz and this alteration may also be present in the brain. Although the meta analysis showed that serum/plasma BDNF levels did not correlate with either the positive or negative symptom in Sz people, the plasma BDNF levels were positively correlated (r2 = 0.14) with certain cognitive functions (e.g., semantic generation tasks) and auditory processing after computerized cognitive training. Notwithstanding the significant result in Sz studies, plasma BDNF is unlikely to prove to be a specific biomarker for the disorder because reduced plasma BDNF is also present in bipolar disorder[35,36] and major depressive disorder[36,37]. Combining the study of peripheral blood levels and neuroimaging, it has been shown that BDNF levels in the serum/plasma positively correlate with N-acetylaspartate (r2 = 0.15), a marker of neuronal integrity, and brain activity (r2 = 0.2), which is measured by functional magnetic resonance imaging, in the parietal cortex. This means that peripheral BDNF levels may be a prognostic marker, as they return to normal during remission from acute states of bipolar disorder and major depressive disorder. Whether people with Sz show similar patterns throughout different phases of their illness warrants further investigation. The question of whether antipsychotic treatment itself can affect BDNF levels has resulted in conflicting data. A meta-analysis reported that antipsychotic treatment increased BDNF levels in plasma but this was not seen in studies which examined levels in serum. However, it should be noted that the heterogeneity across studies in meta-analyses was high and the increase in BDNF levels after antipsychotic treatment was small (Hedges’ g = 0.24). Furthermore, most of the studies evaluating changes of BDNF levels with antipsychotic treatment produced negative result for people with Sz[40-43] and those with treatment resistant Sz. More detailed longitudinal studies will probably be required to determine if increased BDNF levels in the serum/plasma is a trait biomarker for the disorder or has some prognostic value as a disease state biomarker that can predict improvements in symptoms with treatment. Another category of biological pathways that has been receiving a lot of attention in the search for markers for Sz are those involved in immunological/inflammatory processes[9,10,45]. A comprehensive review of serum/plasma biomarkers that allow the differentiation of people with Sz from controls suggests that more than 70% of potential biomarkers for the disorder are involved in the inflammatory response. The immune related biomarkers from the review include S100 calcium-binding protein B (S100B), interleukin 6 (IL-6), IL-2, and tumor necrosis factors (TNFs). The cytokines most frequently reported as changed in the serum of people with Sz include up-regulation of pro-inflammatory cytokines (i.e., IL-6, IL-2, TNF, IL-1β and IL-8) or some of their receptors [i.e., IL-2 receptor-α (IL-2Rα), IL-1 receptor antagonist[46,47]]. In addition, levels of mRNA of TNF-α and IL-1β genes have been shown to be increased in PBMC from people with Sz and their siblings, compared to controls, whereas, reduced interferon-γ (IFN-γ) mRNA has been identified in PBMC of people with Sz. However, it should be noted that people with bipolar disorder also showed increases in some of the pro-inflammatory cytokines such as IL-6, TNF, and IL-1 in serum. Similarly, when a study examined the cell cycle-related histone biochemical properties (i.e., total histone synthesis rates and H2A and H3 histone variant patterns of the nuclear extracted histone fraction) of lymphocytes, there are alterations that are common to both Sz and bipolar disorders. Finally, in terms of cell numbers, T lymphocytes and monocytes have been found to be increased in Sz[51,52]. Taken together, these results indicate that people with Sz showed increases in pro-inflammatroy cytokines as well as lymphocyte numbers. However, some of these changes in “inflammation” components are shared with people who have bipolar disorder and this may reflect commonalities between these two disorders. It is worth noting that, contrary to what occurs in people with Sz, a study investigating systemic inflammatory condition in a large cohort of individuals undergoing their first episode of psychosis (n = 117) showed that the majority of soluble elements of the pro-inflammatory are not significantly altered in PBMC. However, they did find significant increases in intracellular molecules involved in pro-inflammatory pathways in PBMC (i.e., nuclear factor κB, inhibitory complex IκB, inducible isoforms of nitric oxide synthase, cyclooxygenase) alongside significant decreases in some anti-inflammatory proteins (i.e., prostaglandin 15-dexoy-PGJ2 and peroxisome proliferator activated receptor-γ). The results indicate that the peripheral markers may change at different disease stages, but together suggest that the peripheral immune system is over-activated in both individuals undergoing their first episode of psychosis and people with Sz. However, it is important to note that the immune system is dynamic and will be sensitive to changes of cellular environment or medication status, which are confounds often not controlled for in the studies in Sz[10,45,46,54]. Evidences have shown that antipsychotic drugs can modulate components of the inflammatory-related pathways[55-57]. For example, serum levels of pro-inflammatory cytokines (i.e., IL-2)[58,59] and anti-inflammatory cytokines (i.e., IL-1RA and IL-10) have been reported to be lower after treatment with typical or atypical antipsychotic drugs[58,59]. In lipopolysaccharides (LPS)-induced or polyinosinic: Polycytidylic acid-stimulated PBMC cultures, antipsychotic treatment altered immune function by suppressing the levels of IFN-γ and MCP-1 and raising the levels of IL-4, IL-10, IL-18 and RANTES[61,62]. Immune cell counts can also change in people with Sz after antipsychotic drug treatment; haloperidol increased CD3+ T cells, CD4+ T cells, and IL-2-secreting cells, together with CD4/CD8 ratio after 12-wk of treatment. In addition, clozapine treatment initially (12 wk) increased CD34+ T cells, neutrophils and leukocytes. Over longer term, slightly elevated plasma IL-6 levels were observed in chronically clozapine monopharmacy-receiving patients, compared to controls. Therefore, whilst it is still too early to draw any firm conclusions, current data indicate that decreased levels of cytokines are associated with antipsychotic treatment, whereas, T cells numbers were generally elevated by antipsychotic treatment. The immune responses to changes of cellular environment have been measured and reported to be altered in people with Sz[62,65,66]. For example, out of 107 immune molecules, less IL-18 and more S100A12 (ENRAGE) were secreted by blood cells in ex vivo cultures obtained from first-onset people with Sz compared to controls following stimulation condition with a T cell stimulator (i.e., anti-CD28/CD49d), an effect replicated in an independent cohort. In addition, T cells from people with Sz had significantly lower proliferative responses following stimulation with anti-CD3, compared to controls, a response not affected by antipsychotic medication. When PBMC from people with Sz were stimulated with bacterial LPS they released more protein of MCP-1, MIP-1α, IL-8 and IL-18 but less RANTES (for “regulated upon activation normal T cell expressed and secreted”, a pro-inflammatory chemokine) and IFN-γ. Collectively, the data suggests that changes of immune response to changes of cellular environment in Sz people could be complex. There is evidence to suggest that the levels of some inflammatory molecules in blood are correlated with symptom severity in people with Sz[10,33,48,60,63,67]. For example, plasma levels of IL-2 in people with Sz were reported to be positively correlated with the scores in cognitive tests of digit span test (r2 = 0.17) and intelligence (r2 = 0.19), and negatively correlated with the presence of negative symptoms (r2 = 0.2), levels of IL-1β and TNF-α mRNA in PBMC were positively correlated (r2 = 0.17) with scores on the general psychopathology factor of the PANSS and changes in serum IL-10 levels were significantly correlated with improvements in symptoms [i.e., negative, general psychopathology and total score (r2 = 0.1-0.2)] among people with first-onset Sz. Levels of the chemokine, CCL-11, were not only higher in people with Sz but were negatively correlated with performance on the working memory test (r2 = 0.16) and positively correlated with a cognitive flexibility task (r2 = 0.26). Moreover, increased S100B positive natural killer cells in blood from people with acute Sz correlated with the perception of stress (r2 = 0.08) whilst increases in CD4 positive cells correlated with an improvement of clinical symptoms in people with Sz (r2 = 0.1). In summary, people with Sz demonstrate a distinct profile of immune peptides, aberrant immunological responses, and changes of immune cell counts. For example, higher plasma levels of IL-2 appears to be a promising Sz specific biomarker which may reflect the clinical symptom as well as cognitive function particularly since the levels decrease following treatment with antipsychotic drugs[58,59]. Some of these changes in the immune system markers correlate with treatment responses and symptom profiles, suggesting they may be suitable theranostic markers. However, the majority of the studies focused on cross-sectional group differences, and since the immune process is highly dynamic and changes are often transient, more research into the longitudinal patterns of immune profiles will be helpful to determine whether markers of this system are good candidates for indicating treatment responses. Monoamine neurotransmitters such as dopamine (DA), norepinephrine (NE) or serotonin [5-hydroxytryptamine (5-HT)] have been postulated to associate with pathogenesis of Sz, primarily as a result of the pharmacological profiles of the drugs used to treat the disorder. A number of dopaminergic markers have been evaluated in blood from people with Sz, including DA receptors (i.e., DRD2, DRD3, and DRD4), DA transporter (DAT), and other molecules associated with the dopaminergic system [i.e., tyrosine hydroxylase (TH)]. Both mRNA expression and receptor binding of DRD2 were increased in lymphocytes from people with Sz who were drug-naive[71,72], however the up-regulation of DRD2 mRNA was not replicated[73,74]. The levels of lymphocyte DRD3 mRNA was reported to be elevated in both people with chronic Sz[73,75] and people with Sz who were drug-naïve. However, it was also reported to be down-regulated in people with Sz and people with bipolar disorders. For DRD4, the mRNA has been reported to be either down-regulated in CD4 positive T cells or not different in people with Sz. It is noteworthy that higher DRD3 mRNA has been reported in people with heroin addiction, whilst lower DRD4 mRNA has been reported in people with major depression as well as during alcohol and heroin withdrawal. There is evidence to suggest that lymphocyte DRD2 mRNA levels positively correlate (r2 = 0.2) with positive symptoms of Sz. This provided some indirect support for the report that DA uptake by platelets correlated with delusional state of people with Sz. In addition, the changes of lymphocyte DRD3 and DRD5 mRNA were associated with symptom severity (effect size = 1.46). As well as these changes in markers for DA receptors, DAT mRNA is reported to be higher in lymphocytes from people with chronic Sz compared to controls, by contrast, reduced DAT binding was reported in people with Sz, suggestive of a lower number of the DAT protein. TH mRNA has been reported as increased in PBMC of both people with Sz and their siblings compared to controls. Other changes such as elevation of plasma homovanillic acid (HVA), a breakdown product of DA, were noted among people with Sz, people in the prodromal phase and those with schizotypal personality disorder but not in people with bipolar disorder, suggesting some disorder specificity. In addition, protein of DA- and cAMP-regulated neuronal phosphoprotein of 32 kDa (DARPP-32), a critical downstream target of DRD1 and DRD5-mediated signaling, was decreased in CD4 positive T lymphocytes and CD56 positive natural killer cells from people with Sz in comparison to control group, indicating lymphocytes may therefore function as an easily accessible model to study the DA intracellular signaling in the cells of people with Sz. Overall, some of the markers (i.e., TH and HVA) may prove to be markers for a high risk population, such as people with a family history of the disorder as they were not only dysregulated in people with Sz[48,80] but also in their siblings as well as in prodromal individuals of Sz or people with schizotypal personality disorder. One caveat of using monoamine related molecules as biomarkers is that most of the antipsychotics would block their receptors. This effect is not limited to the CNS, therefore the drugs may dynamically change the peripheral profile of monoamine-related receptors and metabolites. Thus monoamine related molecules in the blood may prove to be state markers instead of the stable trait markers that are suitable for diagnosis. However, studies on the longitudinal changes in peripheral monoamine related molecules necessary to address this hypothesis are scarce. Thus, in terms of the effect of antipsychotics, a single study found that lymphocyte DRD2 and platelet 5-HT2A receptor binding were both reduced after treatment with antipsychotics. In addition, lymphocyte DRD3 and DRD5 mRNA was reported to show dynamic, non-linear changes in people with SZ who were drug-naïve in the beginning of follow-up. Briefly, mRNA of the DA receptors peaked at week 2 after taking antipsychotics, after which it decreased but was above baseline at week 8[76,77]. Finally, it has been reported that both risperidone and clozapine elevate plasma NE levels, with risperidone producing a smaller effect. Logically, considering their close ties with the pharmacological properties of antipsychotics, peripheral monoamine related molecules might be a good indicator for treatment response but current evidence to support this posit is lacking. Because glutamatergic dysregualtion may play a role in the pathogenesis of Sz, there is a body of research focusing on peripheral levels or functions of the amino acids, such as glutamate, D-serine, L-serine, glycine, and agmatine, that activate N-methyl-D-aspartate (NMDA) glutamate receptors[86-89] and are involved in modulating the glutamatergic neuronal pathways. Most studies focused on peripheral glutamate levels in people with Sz. In a meta-analysis of 10 studies, higher levels (standardized mean difference = 0.64; 95%CI = 0.21-1.06) of glutamate have been reported in blood from people with Sz compared to controls, however, similar dysregulations have been reported in the small number of studies that focused on major depressive disorder[90,91], suggesting the alteration of glutamate levels is not specific to the diagnosis of Sz. Interestingly, the response of platelet intracellular calcium to glutamate was greater in people with Sz than in controls, suggesting NMDA receptor may be more sensitive in these people. A single study has reported that people with Sz had higher levels of plasma agmatine, an endogenous substance that is synthesized from L-arginine and is proposed to be a new neurotransmitter, than controls, and that the levels correlated with their PANSS score, suggesting that plasma agmatine levels may be a potential diagnostic biomarker for Sz. Lower plasma D-serine, D-/L-serine ratio were found in people with Sz who were treatment-resistant, but chronically people with Sz showed higher plasma D-serine and glycine levels. In addition, the plasma levels of D-serine were associated with improvements in positive symptom, but not with cognitive functions in people with Sz. A study examining the effects of clozapine treatment on D-serine, L-serine, and glycine in people with Sz who were treatment-resistant, showed glycine levels and the glycine/L-serine ratio were significantly increased following clozapine treatment, suggesting that plasma L-serine and glycine could be potential therapeutic markers. In summary, higher levels of blood glutamate has some potential to be a diagnostic marker for Sz, but its correlation with major depressive disorder warrants further investigation in order to determine the specificity of the changes. Of other neuronal chemicals associated with the pathogenesis of Sz, levels of plasma γ-aminobutyric acid have been reported to be lower in people with Sz as well as bipolar disorders compared to the control group. By contrast, plasma reelin, which is involved in the migration of neurons; and adenosine deaminase activity, a homeostatic modulator that affects brain DA and glutamate activities, were higher in people with Sz. It is also of note that acute metabolic stress in the brain, induced by pharmacological doses of 2-deoxyglucose (2DG), a glucoprivic agent transported across the blood-brain barrier into brain tissue where it inhibits intracellular glucose metabolism and produces a clinical state similar to hypoglycaemia, appears to affect the peripheral vesopressinergic system via the pituitary-adrenal axis[96,97]. In addition, after 2DG treatment people with Sz had higher 2DG-induced plasma adrenocorticotropic hormone levels, HVA, and 5-hydroxyindoleacetic acid levels. These data suggest that central acute metabolic stress may alter the metabolism in peripheral dopaminergic and serotonergic systems via hormones (Figure 1). In PBMC, both people with first episode of psychosis and chronic Sz show decreased protein levels of cannabinoid receptor 2 (CB2), however, levels of CB2 were influenced by the medications and cannabis use history, suggesting endocannabinoid system presented at the initial phases of psychosis could be contributing to the pathophysiology of the disease and constitutes a possible treatment response biomarker of psychotic disorders. In the cholinergic system, a decrease of a7 acetylcholine receptor (AChR) mRNA levels has been reported in lymphocytes from people with Sz that was not affect by antipsychotic treatment, suggesting AChR as a peripheral trait makers of Sz. Finally, a single study reported that the density of the peripheral-type benzodiazepine receptors in platelets is a predictor for aggressive behaviors in people with Sz showing an association with higher scores for overt aggression, hostility and anxiety. This particular marker may prove useful for defining a subgroup within the syndrome of Sz. However, considering limited evidence so far, it is too early to predict the robustness of these markers. All of the markers require validation in larger cohorts and need to be assessed for specificity before their usefulness can be assessed. The pattern of oxidative stress markers in the plasma was examined in several studies. Psychotic patients in general are in a significantly increased long-term condition of oxidative stress[102,103]. Oxidative stress markers, such as pentosidine, glycer-AGE and thiobarbituric acid reactive substances[103,106] were found to be higher among people with Sz and carbonyl stress was found to be lower in people with the disorder[104,105,107]. However, those oxidative markers have overlapping levels between people with Sz and healthy individuals, suggesting the discriminability of those markers is low. One group suggested that only a subgroup of study participants with the glyoxalase I (GLO1) deficits showed distinct patterns of oxidative stress abnormality in the plasma, suggesting GLO1 deficits and oxidative stress may contribute to development of a certain subtype of Sz. However, evidence also suggests these oxidative markers show dynamic non-linear changes during hospitalization and levels could be associated with the dosage of antipsychotics irrespective of the treatment responses. If this finding is replicated, the utility of these markers may be restricted to determining medication compliance. In light of the tendency of people with psychiatric disorders, particularly Sz, to develop metabolic syndrome, several studies have examined molecules involved in glucose homeostasis[95,108-113]. In a study where PBMC were stimulated ex vivo with staphylococcal enterotoxin B, eight out of total of 18 proteins examined were differentially expressed in cells from people with Sz who were first onset and drug-naive Sz compared to controls. These proteins belonged to the glycolytic pathway, indicating that impaired glycolytic response could be a potential early stage of diagnostic biomarker for Sz. Mitochondrial complex I, the first enzyme in the mitochondrial respiratory chain for the oxidation of glucose, was found to have increased activity in the platelets from people with Sz and to have higher mRNA levels in blood from people with Sz[111,113]. It has also been reported that the activity of platelet mitochondrial complex I is associated with positive symptoms and clinical disease course in people with Sz. Significantly, the activity of platelet mitochondrial complex I is not altered in people with bipolar disorder and mRNA levels for platelet mitochondrial complex I is not altered in white blood cells from people with autism spectrum disorder. These latter findings are an indicator that the activity of platelet mitochondrial complex I is associated with positive symptoms and clinical disease course may be specific to Sz and a potentially useful biomarker for those features of the disorder. The utility of these markers is thrown into doubt by a study in T-lymphocytes which reported that antipsychotic drugs affect the expression of a large number of genes and that some of those genes were related to oxidative stress and metabolic disease. In addition, it has been suggested that molecules involved in glucose homeostatsis may also be predictors for people who develop extrapyramidal symptoms after receiving antipsychotics. Thus, it may be that rather than being markers for diagnosis, some of the molecules involved in glucose homeostatsis might be potential markers for either susceptibility to side-effects or for medication compliance. Epigenetic factors can potentially alter susceptibility to Sz. Thus, it is not suprising that studies have evaluated the global methylation pattern in people with Sz[117-120]. Overall, leukocyte DNA from people with Sz had lower methylated deoxycytidine (mC) content compared to controls. In addition, a genome-wide study showed there were 234 CpG sites (0.04% of CpG sites) that were differentially methylated in both people with Sz who were drug-naïve compared to controls and in people with Sz compared to their discordant monozygotic twin sibling, with most of the sites located in promoter regions of genes. Further studies have reported that in PBMC from people during their first onset of Sz there were 603 CpG sites (2% of CpG sites) that were differentially methylated, the genes that were particularly affected were related to the nuclear lumen, transcription factor binding, and nucleotide binding. Using whole blood, a methylome-wide association study showed that 139 CpG sites (0.003% of CpG sites involved in analyses) were differently methylated in people with Sz, highly implicating an exon and 3’UTR of FAM63B and an intron of RELN. Overall, differentially methylated CpG sites can be detected in peripheral blood of people with Sz and many of the methylation was reported in the promoter regions of genes, therefore they may affect transcription of these genes. However, it remains to be determined if the changes in methylation are correlated to changes in levels of gene expression, the mechanism by which methylation predominantly regulates gene activity. The central regulatory role of microRNA (miRNA) in gene expression makes them promising biomarkers for Sz. Whilst there have been a number of studies focusing on miRNA in brain samples, relatively few studies have examined them in peripheral blood. Of these studies, reported changes in miRNA include up-regulation of hsa-miR-34a[123-125] and down-regulation of hsa-miR-432[123,126] in PBMC from people with Sz, which have been replicated in independent studies. However, the data for other miRNAs are conflicting. For example, hsa-miR-21 and hsa-miR-30e have been reported to up-regulated[125,127] and down-regulated in PBMC from people with Sz. Likewise, levels of hsa-miR-30e and hsa-miR-181b were altered in opposite directions[124-126] in studies using plasma from people with Sz. It has been reported that antipsychotic treatment is associated with changes of miRNA levels in human plasma[124,128] and T-lymphocyte cell lines. The expression levels of hsa-miR-365, hsa-miR-520c-3p, and hsa-miR-181b in plasma were significantly down-regulated after antipsychotic treatment[124,128], of these, miRNA-181b expression levels were positively correlated with the improvement of negative symptoms. Finally, an in vitro antipsychotic treatment response study in T-lymphocyte cell lines demonstrated that miR-200c-3p and miR-28-5p were down-regulated in haloperidol-treated cell lines compared to controls. Given the variance in data regarding levels of peripheral miRNAs, the consistent findings of hsa-miR-34a and hsa-miR-432 as well as their expressions levels were not changed following treatment, these have implied their potential as diagnostic markers. In sum, peripheral epigenetic markers might be a promising direction for finding biomarkers for Sz. The methylation patterns and miRNA expression patterns have both shown differential patterns between people with Sz and controls. However, considering the discrepant results mentioned above, the consistency between studies warrant further investigation. Modern technologies allow the investigation of levels of thousands of mRNAs and proteins at the same time. The studies at the levels of mRNA are known as studies of the transcriptome whereas studies at the levels of proteins are known as studies of the proteome. Most studies of the transcriptome have involved measuring levels of mRNA is gene expression microarrays. In psychiatry, such studies have involved the use of whole blood[129-131], lymphocytes or PBMC samples[133-135] to identify potential biomarkers for Sz. Other studies examined proteomics information in RBC, T cells, and serum[61,109,137,138] in attempts to answer the same question. This approach has typically led to a large set of mRNAs or proteins being proposed as possible biomarkers in Sz but most findings await replication. Briefly, in a whole blood study from people during their first onset of Sz, the expression of glucose transporter (SLC2A3) and actin assembly factor (DAAM2) were increased, whereas zinc metallopeptidase, neurolysin 1 and myosin C were significantly decreased, compared to controls, indicating peripheral mRNA of these genes could be a potential biomarkers in early stage of disease course. A genome-wide expression analysis in PBMC samples from people with Sz was characterized by alterations of genes with immune system function[133,135] with some differentially expressed genes, such as argonaure 2, myocyte enhancer factor 2D, Enah/Vasp-like, peptidase inhibitor 3, S100 calcium binding protein A12 (S100A12), defensin α4 (DEFα4) as well as AKT1 being confirmed as changed using qPCR, the result supporting the hypothesis that the disorder has a significant immunological component in its etiology. In addition, a microarray study identified six genes [including B cell translocation gene 1, glycogen synthase kinase 3α (GSK3α), HLA-DRB1, heterogeneous nuclear ribonucleoprotein A3, selenium-binding protein 1 (SELENBP1), and splicing factor] which were differentially expressed in both brain and peripheral blood of people with Sz. Of these, SELENBP1 was identified as the strongest candidate biomarker among all genes differentially expressed in Sz, because it was the only gene showing significant differential expression in a similar direction in both brain and blood. However, the result of up-regulation of SELENBP1 and up-regulation of GSK3A in peripheral blood was not replicated in the other studies. Another study reported several genes related to nucleosome and histone structure were dysregulated in PBMC of both people with Sz and their siblings, suggesting a potential epigenetic mechanism underlying the risk state for the disorder. Other differentially expressed genes in PBMC were involved in pathways such as cell adhesion and neuronal guidance, neurotrophins, oxidative stress and glucose metabolism, and apoptosis and cell-cycle regulation, all of which have some face value for the pathophysiology associated with Sz. For the studies reporting discriminability of the markers, a study using whole blood from people with Sz who were drug naïve identified 14 probes which annotated 11 genes (listed in supplementary material) that predicted diagnosis with 91.2% accuracy in the training set and 87.9% accuracy in the validation set, however, this study lacked qPCR analysis to validate the microarray data. A microarray using white blood cells of discordant sib-pairs for either Sz or bipolar disorder identified a set of 35 transcripts which can discriminate people with Sz from people with bipolar disorders and their unaffected sib-pairs with 95% accuracy. However, only few genes [i.e., Serotonin receptor type 4 (5HT4), transcription factor-like 4, and neuregulin 1] were confirmed using qPCR and there has been no subsequent validation study for the prediction model. Collectively, the inconsistent findings of this type of study may result from the heterogeneity of the preparations used, the people with Sz being at different clinical courses of the disorder (i.e., first onset or chronic stage) and the fact that Sz is a spectrum rather than a discrete illness. Of the studies discussed, only one followed up the differentially expressed RNA levels in whole blood of first onset Sz people for 12-24 mo. DAAM2, one of five differentially expressed genes, returned to control levels in the whole blood when people were in remission after their first psychotic episode, suggesting this mRNA could be altered by antipsychotics and may be a potential marker for treatment response. Taken together, there is only down-regulation of intercellular adhesion molecule in people with Sz that were replicated in at least two microarray studies[138,140]. Other studies have identified markers that may be of use in identifying people who are at risk of developing the disorder, such as the up-regulation of DEFA in T cells and plasma from people with Sz, and both their affected or unaffected monozygotic twin. Of interest is the down-regulation of apolipoprotein A1 identified in both red blood cells of people with Sz and serum of people with Sz who were drug-naive. Not only does this suggest it might be a trait marker but a similar pattern was shown in postmortem brain tissue, suggesting that the peripheral changes reflect central pathophysiology. Proteomics studies have resulted in a signature comprised of 34 serum protein analytes that have 60%-75% discriminant accuracy in separating people with Sz from those with major depression, bipolar disorder, Asperger syndrome and controls, suggesting these proteins in blood serum as a potential biomarker for Sz. In addition, 27 serum proteins were identified as discriminating between people with Sz and healthy controls and highlighted some proteins among them with important roles in the immune system. It has been reported that dysregulation of 4 serum analytes [up-refulation of 2-piperidinec carboxylic acid, along with the down-regulation of 6-deoxy-mannofuranose, galactoseoxime, and a serum peptide (m/z 3177)] have the best discriminating value between people with Sz, and controls, indicating that metabolomics and proteomic approaches can be used in the biomarker research. Overall, the outcome of current omic studies has been the identification of a number of potential biomarkers in peripheral blood with a cluster of reports suggesting that markers associated with immune function/inflammation might be of interest, however the utility of these need to be confirmed. As can be seen from the précis of studies to date, the search for biomarkers of Sz in peripheral samples is flourishing. Markers that have consistently been altered in two or more individual studies are summarized in Figure 3. It is possible that some of the differential patterns reported to exist in people with Sz can be used for diagnostic purposes. However, only a few studies reported the sensitivity and specificity of the discriminability of their markers[108,123,125,130,138,140,141], leaving doubt as to the potential of the other molecules to act as markers. To try and assess the utility of these disparate markers, performing a meta-analysis based on the categories we used here might be helpful to identify potential markers that have large and consistent effect size across studies. On the other hand, as some studies have shown, peripheral biomarkers may be more useful as state indicators. The changes of some biomarkers appear to be associated with clinical outcome, treatment responses, and the changes of clinical symptoms, suggesting they might be useful for specific clinical events, an opportunity that has been ignored in the search for diagnostic markers. Figure 3 Representation of potential peripheral biomarkers for schizophrenia. Only markers consistently reported in two or more individual peripheral studies are listed in the figure. The markers were classified as either diagnostic (D), antipsychotic TR or both. SZP indicates those markers have been reported to correlate with phenotypes (i.e., clinical symptom or cognitive function) in people with schizophrenia. Some markers were NS for schizophrenia. PBMC: Peripheral blood mononuclear cell; BDNF: Brain-derived neurotrophic factor; IL: Interleukin; TNF: Tumor necrosis factor; HVA: Homovanillic acid; Vit. B6: Vitamin B6 (pyridoxamine); ICAM: Intercellular adhesion molecule; DRD2: Dopamine receptors D2; IFN: Interferon; CB2: Cannabinoid receptor; TR: Treatment response; NS: Not specific. An important factor that hasn’t been considered in many studies is whether or not the candidate peripheral biomarkers showed similar patterns in other psychiatric diseases. It is important to recognize that several psychiatric diseases can share some of the same components with Sz[12,142,143]. Based on the limited studies so far, many of identified markers were not specific to Sz but were shared with other psychiatric diseases such as bipolar disorders[47,50,70,80]. The next step of peripheral biomarker development would be examining the candidate markers in other psychiatric diseases. Having Sz specific biomarkers can increase the efficiency of disease diagnosis as well as improving treatment strategies. One question raised by this review is the blood-brain relationship. Most of the studies mentioned above (approximately 70%) were prompted by findings related to the brain. For instance, neurotransmitters apparently behave differently in the peripheral system than in the brain, yet many studies have focused on the neurotransmitters implicated from neuroscientific studies of Sz. This often leads to inconsistency among studies, and patterns found in the brain oftentimes fail to be found in the peripheral blood. Nevertheless, even if the neurotransmitters were to behave differently in the periphery, some evidence suggests they can be biomarkers for treatment effect. We suggest the biomarkers in the peripheral blood should be initially simply viewed as whether or not they have clinical utility rather than whether they may be tied to the aetiology of Sz. If a similar dysregulation can be seen in the brain or the aberration of the peripheral molecules were related to clinical symptoms it would add more information for interpreting the potential peripheral biomarker. In this respect, given it is known that many biomarkers have been shown to be affected by factors such as fasted/fed state, diurnal and seasonal rhythm and disturbances in sleep efforts should develop standardized blood collection procedures in order to decrease study to study variation. Alternatively, the exact specimen collection protocol, time of collection, anticoagulants used and methods of blood processing should be accurately described in any blood study seeking to report findings on potential biomarkers in Sz. The authors thank Chun-Chieh Fan for his comments of the review.